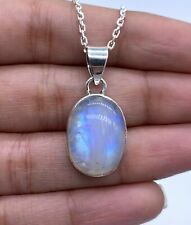 Stunning Moonstone 925 Stamped Sterling Silver Oval Pendant IS. Stone Size: 18mm x 13mm. Velvet Pouch. Stunning Moonstone 925 Stamped Sterling Silver Pendant IS. Stone Size: 10mm x 10mm. Velvet Pouch. 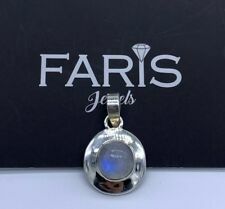 Stunning Faris Jewels Moonstone 925 Stamped Sterling Silver Pendant IS. Stone Size: 30mm x 13mm. Velvet Pouch. (This beautiful, handmade pendant weighs 2 g. BEAUTIFUL OVAL CUT RAINBOW MOONSTONE GEMSTONE STAMPED 925 STERLING SILVER PENDANT - weighs 2 g - (my code SSE470) - Code 2. All 925 sterling silver pieces of jewellery that are over 7.7 g in weight are stamped with a London Goldsmiths Assayer’s hallmark that is 0.75 mm in size and is composed of 4 symbols: the sponsor’s mark (my initials); 925; London Goldsmiths leopard’s head; and the year letter mark). Stunning Faris Jewels Moonstone 925 Stamped Sterling Silver Pendant IS. Stone Size: 13mm x 13mm. Velvet Pouch. Natural, double cabochon, moonstone gemstone pendant. NB - The expected blue flashes typical of moonstone are present, but I was unable to recreate them while photographing the pendant. Rainbow Moonstone Round Pendant, Solid Sterling Silver, New, 12mm, UK seller. Solid Sterling Silver round rainbow moonstone pendant in crown setting. These pendants are all of a great colour, with plenty of blue flashes. Supplied on an adjustable solid Sterling Silver curb chain, which can be worn at either 16/18" length as it has an extra ring for fastening. Superb Sterling Silver & Blue Moonstone Pendant, that has a fantastic inner Blue Neon Fire as it catches the light. A really gorgeous natural stone that flashes a wonderful neon blue as the light catches it, enhanced by its natural flaws. Rainbow moonstone and white Topaz pendant, fancy in shape and checkerboard faceted. This has been 4 double prong set into 2.52 grams of 925 Sterling Silver. The white Topaz is set around the Moonstone at 3,7 and 11 there are 3 of these all round in shape and 1.5 mm in size, weighing 0.05 carats, from Brazil. Rainbow Moonstone swirl pear pendant, Solid Sterling Silver, New. UK seller. Solid Sterling Silver smallish 16 x 12mm rainbow moonstone pendant. Marked 925 for Sterling Silver on reverse of pendant and chain. Supplied on an adjustable solid Sterling Silver snake chain, which can be worn at either 16/18" length as it has an extra ring for fastening. Superb Sterling Silver & AAA Blue Fire Moonstone Pendant, that has a fantastic inner Blue Neon Fire. Moonstone is one of the birthstones for June. A really gorgeous natural stone that flashes a wonderful neon blue as the light catches it, enhanced by its natural flaws. This moonstone oval pendant will match just about any form of apparell, because of it's wonderful iridescence and flash of a myriad colours, even thought it is predominantly white! The crystal growth habit includes blocky, or tabular crystals. Natural, moonstone gemstone pendant in a very unusual and ornate setting, in the shape of a crescent moon. Gemstone : Rainbow Moonstone (Genuine). Finish : Oxidized. Pendant Weight : 5.0 Grams (Approx.). Wholesale Lots (28). Toe-Rings (5). Brooches (6). Gemstone Total Carat Weight : 6.8. Gemstone Shape : Round, Oval. A really Superb Large Sterling Silver and AAA Blue Moonstone Pendant on a Sterling Silver Chain. Fab inner blue neon fire to the Moonstone as it catches the light, enhanced by its inner flaws, making it a real eye catcher. Rainbow Moonstone small round pendant, Solid Sterling Silver, New, 8mm. UK. Solid Sterling Silver small (8mm) round rainbow moonstone pendant. Supplied on an adjustable solid Sterling Silver curb chain, which can be worn at either 16/18" length as it has an extra ring for fastening. They are encased in solid sterling silver, which is hallmarked to the reverse. Large, Chunky & Superb Sterling Silver, Sri Lankan Blue Effect Moonstone & Garnet Pendant. Lovely Blue Neon Flashes as the Moonstone moves, enhanced by its natural flaws. Stunning Moonstone 925 Stamped Sterling Silver Pear Cut Pendant IS. 16" 925 Sterling Silver chain Included! Stone Size: 40mm x 20mm. Velvet Pouch. A really Superb Large Sterling Silver and AAA Blue Moonstone Pendant. Fab inner blue neon fire to the Moonstone making it a real eye catcher. Gorgeous Colour Mix, and Neon Blue Flashes from the moonstone as it moves, enhanced by its inner flaws. 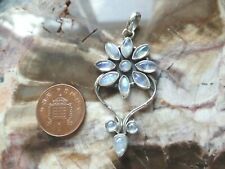 Superb Sterling Silver & Blue Effect Moonstone Flower Pendant, that has a fantastic inner Blue Neon Fire as it catches the light. Moonstone is one of the birthstones for June. Natural, double moonstone gemstone pendant. A solid silver pendant set with copper moonstone and cut white topaz gemstones. Or why not just treat yourself! Hand crafted in Jaipur, India from 925 silver. A really and Unusual Eye Catching Pendant with a large bale. Moonstone is the Birthstone for June. Superb Retro Style Sterling Silver & Blue Moonstone Pendant, that has a fantastic inner Blue Neon Fire. A really gorgeous natural stone that flashes a wonderful neon blue as the light catches it. Lovely Neon Blue Flashes at it moves in the light. 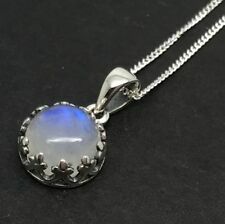 Stunning Moonstone 925 Stamped Sterling Silver Pendant IS. 18" Sterling Silver chain included! Stone Size: 38mm X 15mm. Velvet Pouch. Striking Sterling Silver and Rainbow Moonstone Pendant. Stunning colour when it catches light. Superb Chunky Sterling Silver & Sri Lankan Blue Effect Moonstone Pendant on a good sturdy Sterling Silver Chain. A really gorgeous piece of Natural Moonstone that flashes blue Neon when it catches the light, enhanced by its inner flaws. Lovely mix of colours that work well together. Moonstone is the Birthstone for June. Brand: HandmadeLength: Less than 13"
Stunning Moonstone 925 Stamped Sterling Silver Pendant IS. 18" Sterling Silver Chain Included. Stone size: 37mm X 22mm. Velvet Pouch. Marked 925 for Sterling Silver on reverse and chain. Stunning Moonstone 925 Stamped Sterling Silver Pendant IS. 18" Sterling Silver Chain Included. Velvet Pouch. Solid Sterling Silver round rainbow moonstone triple stone pendant. This pendant is of a great colour, with plenty of blue flashes. Supplied on an adjustable solid Sterling Silver curb chain, which can be worn at either 16/18" length as it has an extra ring for fastening. Natural, moonstone gemstone pendant, in a mostly oval shape. It is possible that your pendant may be made up from both natural and synthetic stones. This stone does have the characteristic blue flashes under the right lighting conditions, but I was unable to capture it in the photographs. Gemstone: Natural Rainbow Moonstone. Necklace: 20" 925 Sterling Silver. Superb Avant Garde Sterling Silver & Indian Blue Effect Moonstone Pendant, with a gorgeous neon Blue flash, on a suitable sterling silver chain. Striking Sterling Silver and Blue Neon Moonstone Pendant on a Sterling Silver Chain June Birthstone. Stunning Faris Jewels Moonstone 925 Stamped Sterling Silver Pendant IS. Stone size 41mm X 28mm. Velvet Pouch. Natural, moonstone gemstone pendant. Usual fiery blue streaks when the light is right. It is possible that your pendant may be made up from both natural and synthetic stones. Gorgeous Sterling Silver and Five Stone Blue Neon Moonstone Pendant, lovely quality stones make this pendant even more eye catching. Superb Sterling Silver & AAA Blue Moonstone Pendant, that has a fantastic inner Blue Neon Fire as it catches the light. A really gorgeous natural stone that flashes a wonderful neon blue as the light catches it, enhanced by its natural flaws. Rainbow Moonstone Round Pendant, Solid Sterling Silver, New, 12mm, Cabochon. Solid Sterling Silver round rainbow moonstone pendant. Supplied on an adjustable solid Sterling Silver curb chain, which can be worn at either 16/18" length as it has an extra ring for fastening. Marked 925 for Sterling Silver on bail and chain. A really Superb Chunky Sterling Silver and AAA Blue Moonstone Pendant. Fab inner blue neon fire enhanced by its natural flaws, making it a real eye catcher. Moonstone is the Birthstone for June. Moonstone White 925 Sterling Silver Small Pendant Jewelry S 1.25"
925 Sterling Silver Rainbow Moonstone Vintage Pendant Jewelry S 2.25"
Saleable Rainbow Moonstone Gemstone Pendant 925 Sterling Silver Jewelry S 1.5"
Moonstone 925 Sterling Silver Vintage Pendant Jewelry S 1.75"
Natural White Colour Natural Moonstone Necklace Pendant. Handmade Pendant.